We design & create luxury wedding favours. Your guests will be amazed when they leave with a memorable bespoke gift reflecting the true personality of your wedding. We offer handmade bath care, skin care and candle favours. 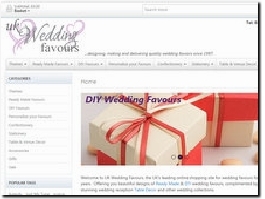 Partyfayre provides personalised wedding favours and gifts. From wedding favours to birthdays, there is a personalised gift to suit any occasion. 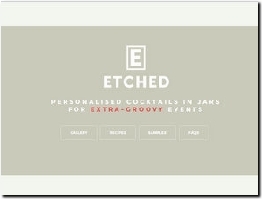 Favour This provides everything you need to create fabulous wedding favours! See our growing range of favour boxes, bags, wedding confectionery, plus ceremony and reception decorations & accessories. Etched Cocktails - Personalised drinks! We are Etched cocktails, creating personalised cocktails in jars for extra-groovy events. We take our own original recipe cocktails and design you a custom label to suit your event, working with everyone from brides to be to professional wedding planners. Designing, making and delivering quality wedding favours and decorations since 1997. 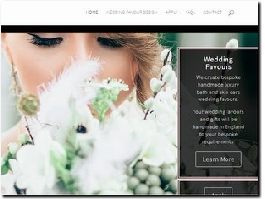 For all your wedding needs visit Loadsagifts.com. We sell everything from favours to ring pillows, tiaras to bridal corsets and personalised thank you gifts for the wedding party. We offer deals on dies to create stunning bespoke cards and wedding invites for all types of weddings. We also supply ribbon and other tools. Personalised Wedding Favour Candles -Decorated in a sheer white organza bag and coordinating mulberry paper rose. Two designs available personalised with names, date and marriage verse. We sell favour boxes, decorations, flower baskets, bridal party gifts and much more for your special day! 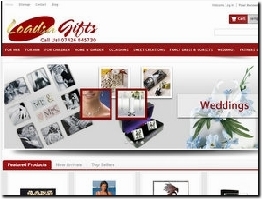 We are your One Stop Wedding Shop, Come and take a look! You have already seen popcorn carts, but have you ever tried more than 15 different flavours? A Pure Popcorn they will create personalised popcorn cones and wedding favours which are uniquely designed to suit the theme of your wedding. Ferrero Rocher Pyramid / Heart / Swan / Butterfly Tower / Display / Stand with Chocolates + Delivery + Setup + Collection. Whatever the occasion, we can make sure its one that your guests will never forget! AuroraSkye have been trading in the Wedding Favour & Gifts Market for a number of years, we offer the best quality products in our industry at competitive prices. Something Sweeter specialise in bespoke Candy Buffets, Candy Carts and Sweet Treats including Cake Pops, Oreo Pops, Sweet Favours, Sweet Trees and Marshmallow pops. Shop at Sixpencefavours.co.uk for the best in original and unique wedding favours and gifts made from genuine English sixpence coins. We are also able to supply bulk quantities of sixpence pieces in an uncleaned or cleaned and polished state. Spoil your wedding guests with the gift of the world’s finest loose leaf tea. Packaged in a reusable and attractive caddy with a personalised label. You can choose from 20 types of tea and from a selection of 9 different background colours and designs. Beautiful personalised ribbon from Creative Ribbon will provide a perfect memento to your invitations, favours, table decorations and gifts. Excellent service and prices guaranteed with a quick turnaround. Sweet Caroline’s specialise in candy cart hire and confectionery. Providing beautiful vintage candy carts to make your event or special day even sweeter. We decorate the cart to suit your theme and provide a variety of options to suit your requirements. Turning your dream Wedding Favours into beautiful Wedding Favours. At Sinders Favours, we work with you to design your Favours unique for you, with matching Wedding Stationery, to bring your whole Wedding together. 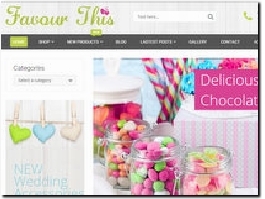 Lindsay Sweets is an online sweet shop that provides wedding favours, organza bags and sweet cones. We even sell bulk bags of sweets. Incense Aromatherapy is an online store selling Gifts that are ideal for Wedding Favours and Bridsmaid gifts. Aromatherapy Soaps Aromatherapy oils, Essential Oils, Room Fragrances, Oil Burners. We are based in the Spa town of Bath, UK. Think Favours are the UK''s leading supplier of quality high end wedding favours, boxes, tins, baby shower gifts and place card holders at a very low price. The leading range of unique and exquisite wedding favours, wedding party gifts and reception accessories in the UK since 2004. From personalised favours to place card holders. Be unique, be inspired, be out of the ordinary. We run workshops for brides looking to make their own bespoke items for their day. We also organise hen workshops and can find a venue near you, bringing bubbly and cakes of course! Say thank you to your guests with beautiful hand made wedding favours.